This is the first 4G capable tablet for both companies and has been designed for the super-fast mobile broadband speeds of T-Mobile’s 4G network. The Streak 7 features Google’s Android 2.2 operating system, a dual core 1GHz NVIDIA Tegra 2 processor and full support for Adobe Flash Player. It also comes equipped with a the rear-facing 5 megapixel camera for high-definition stills and video recording. The front-facing 1.3 megapixel camera with the preloaded Qik Video Chat application provide video-calling over T-Mobile’s network as well as Wi-Fi. The device is also Bluetooth 2.1 capable and comes with 16 GB of internal memory and SD Card slot with support for expandable memory up to 32 GB. The new Streak 7 will feature Dell’s Stage user interface. Later this year, Dell will add syncing to Stage so people can keep their photos, contacts, calendars and other personal content synchronized across their Dell Stage-equipped devices. The Dell Streak 7 also comes preloaded with unique content and applications to entertain the whole family, including: T-Mobile TV, BrainPOP, Zinio, Qik Video Chat, Blockbuster, Kindle for Android, Let’s Golf demo, Slacker Radio and Zoodles. 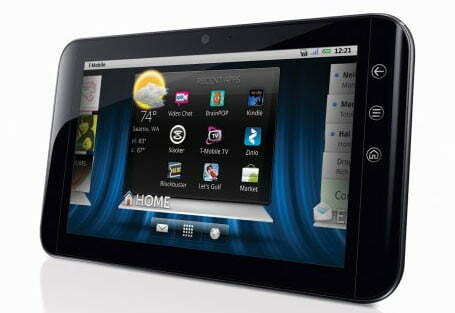 The new Dell Streak 7 Tablet is expected to be available in the U.S. in the coming weeks at T-Mobile retail stores and directly from Dell. No word on pricing yet for the Dell Streak 7, but we’d expect to hear that shortly.